I know I'm a little late to the Brocades party, but new things don't always arrive promptly here. My local CVS only has two colors, so I chose this yellowy-silver. It is definitely fit for the holidays. I feel like Christmas wrapping paper. I kinda feel like brocades are the trend that wasn't. I can see how textured polishes could easily transition into these glitter laden bombs. But textures stayed on, and no other company picked up the "brocade" banner. Though really, these aren't anything new. 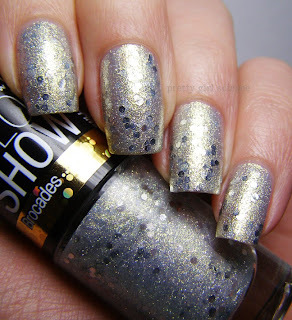 There are hundreds upon hundreds of glittery polishes out there to be found. Anyway, this stuff is pretty great. Two coats brought me to an acceptable opacity, and with my new best friend Gelous, there is no obnoxious texture to be felt. It did have that funny "frothy" feel when I was applying it, but it wasn't as bad as some. I will definitely be on the lookout for a few more of these. thanks! I need more of them. They are pretty tough too, I made it 4 days chip-free! Wow that's amazing, I heard these were chip-city! maybe I got lucky because I used a modified version of that DIY gel-ish thing?